Yes, you read that right. Kraft. I wanted to start 2010 off with some barbecue sauces that you can find at the grocery (or as some of you would call it, the supermarket). Not all of them will be as ubiquitous as Kraft, but I figure this is a good place to start. In the 1950s, J.L. 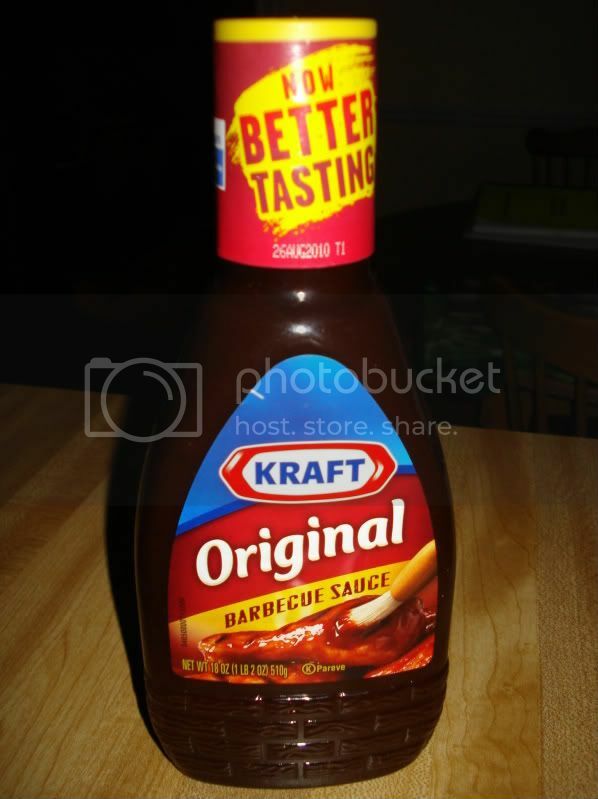 Kraft Co was one of the first companies to sell barbecue sauce on a nationwide basis. Since then, many many companies have followed suit, but Kraft is still the most dominant player in the barbecue sauce market - their current market share hovers around 44 percent! They have created a seemingly endless number of "flavors" - Honey, Thick 'n Spicy, Hickory Smoke, Mesquite Smoke, Light (only 30 calories), Brown Sugar, Honey Roasted Garlic, Hot, Char-Grill - and that's not even all. But for purposes of a review, I figured I'd stick with the original. You maybe wouldn't have guessed it from this sauce's dark brown color, but this sauce is KETCHUPY. It tastes like really sweet Ketchup. There are faint hints of smoke flavor and vinegary tang and some onion and mustard, but I feel like I'm reaching to even mention them. The sauce is extremely thick and smooth, with no textural variety. Overall, this stuff is just way too one dimentional, and the one dimension isn't even executed well. And by the way, that dark color comes from "caramel color." I'm eager to try some "Ho-Made" BBQ Sauce, available at Publix. I'm thinking either that's some sketchy sauce or the hyphen needs to go! You're right. This stuff is GARBAGE. I haven't used it in years. I've hit enough bbq places and know better that to pass this stuff as "sauce" - in name only. I also saw the KC Masterpiece sauce, now owned by Clorox. For any over the counter sauce, it's not bad but prefer some others. I worked at a KC Masterpiece years back in Illinois (once-owned by the Davis Family but not well run locally, imo).